National Public Radio, which fired news analyst Juan Williams last month after pressure from the Council on American-Islamic Relations (CAIR), has featured the Islamist group's leaders on air nearly two dozen times in the past three years, while never addressing CAIR's designation as a cog in a Hamas-support network, a review of NPR transcripts shows. Earlier this year, the Department of Justice stood by its inclusion of CAIR on a list of unindicted co-conspirators in the terror-financing prosecution of the Texas-based Holy Land Foundation for Relief and Development (HLF). That list became public in June 2007, but never has been discussed in any of the NPR broadcasts featuring CAIR Executive Director Nihad Awad, national spokesman Ibrahim Hooper and other officials. For the past two years, NPR has enjoyed a $400,000 grant from the Carnegie Corporation as part of an overall program aimed at "gaining greater understanding of the role of Muslim communities in America's national life." 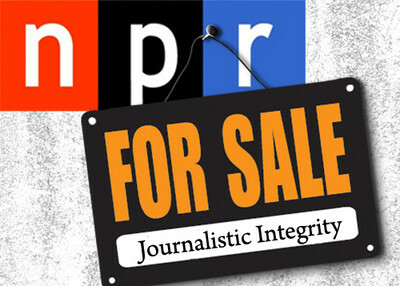 NPR was to "report on the state of Islam in the U.S. and internationally, including profiles of prominent Muslim leaders and experts on Islam." There's nothing wrong with the grant. But a review of NPR's record covering radical Islamist groups in America shows it routinely invites representatives on air but rarely challenges their premises or questions documented links to extremists. The strongest example is CAIR, which issued a statement just before Williams was fired demanding that NPR "address the fact that one of its news analysts seems to believe that all airline passengers who are perceived to be Muslim can legitimately be viewed as security threats." NPR responded to a list of questions sent to Ombudsman Alicia Shepard with a form e-mail response: "Thank you for your thoughts about NPR's termination of Juan Williams. NPR Ombudsman Alicia Shepard wrote this column in response to listener concerns: NPR's Firing of Juan Williams Was Poorly Handled. Please add to the discussion by posting your comments at the end of the blog." CAIR representatives often appear on NPR news and talk shows, but a Lexis search does not find any examples in which they have been challenged about evidence linking them to a Hamas-support network or to law enforcement's decision to cut off communication with CAIR. Alex Cohen did have a report on the issue, quoting the FBI's spokesman explaining why the Bureau cut off communications with CAIR. But there was no follow-up detailing the specifics behind John Miller's assertions "that two of the founding members of CAIR, who were still in those positions at the time, were related to Hamas organizers." For example, CAIR Executive Director Nihad Awad has been on NPR programs seven times since August 2007, and spokesman Ibrahim Hooper has been heard another eight times. It was August 2007 that an FBI agent first testified that Awad participated in a 1993 gathering of Hamas supporters in Philadelphia which sought ways to disrupt the U.S.-brokered Oslo accords. Lara Burns' testimony came in the Hamas-financing trial of the Holy Land Foundation for Relief and Development. Evidence in that case showed Awad and CAIR co-founder Omar Ahmad were part of a network of Hamas supporters in the U.S. Each appears on the internal telephone list of the "Palestine Committee" (entries 25 and 32). The committee, other exhibits show, was created by the Egyptian-based Muslim Brotherhood to help Hamas politically and financially. To date, no NPR reporter or host has asked Awad, Hooper or any other CAIR official about the evidence. Awad has not been asked what he was doing in Philadelphia, referring to Hamas by the simple code word "Samah." Neither has anyone been asked to explain why CAIR is listed among Palestine Committee entities weeks after its creation. To the FBI, these records raise a question about CAIR's purpose, and "whether there continues to be a connection between CAIR or its executives and HAMAS." NPR had CAIR officials on air at least five times to discuss their role in reporting the disappearance last year of five northern Virginia men who turned up in Pakistan hoping to wage jihad against American troops in Afghanistan. A Weekend Edition story headline indicated "FBI-Muslim Cooperation" led to the men's arrests. "The council has been outspoken in condemning terrorism and calling on American Muslims to cooperate with government authorities in investigations," host Scott Simon said to Hooper Dec. 12. Tell that to Minneapolis Somali Muslims, who demonstrated against CAIR for what they considered interference into an investigation involving missing young Somali men who joined the Al-Shabaab terrorist group. The network has not reported on CAIR's campaign against the use of informants in terror-related investigations beyond citing the group's grievance in a California case. Reporter Alex Cohen did balance the June 2009 report by quoting Miller defending the practice. "The FBI has used informants for its hundred years of service," he said. "If you want to know what is going on inside a terrorist group, you're not going to get that information just by coming up and asking people, will you please tell me all the laws you're breaking or violating." CAIR's opposition persists even after convictions are won in court. NPR has some outstanding journalists. But its watchdog role shouldn't stop at the door of national Islamist groups because of ideology or any other reason, including grants to promote a "greater understanding of Islam." The speed with which NPR fired Juan Williams, and the severity of the punishment compared to the offense - an everyday expression - seems unusual. While no one would deny that we do not live in a perfect world and some things said might have been worded differently, and perhaps agreeing that someone might have talked to Juan about his comment, still this event should not escape our attention. We are supposed to believe that NPR was enforcing its "greater understanding of Islam", and that Juan's statement offends Muslims, and the requirements of political correctness called for his firing. A very simple "law" which I defy anyone to find a single real life exception is that the harder the left (the hard left, the moderate left etc), the more virulent it's "alliance partners" in the Islamic terrorist world will be and are. IRA and IRA Front groups partner with FARC, Al-Qaeda, Hezbollah, and Taliban, the "mellowed" Bernadette Dorn's partner with the flotilla front groups, and NPR partners with the "apologist/greater understanding" front groups.